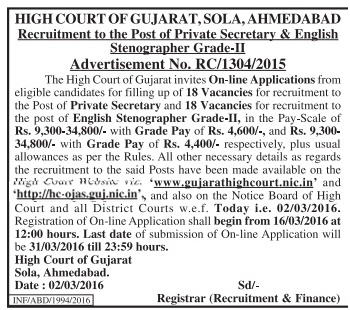 Gujarat High Court published notification for recruitment for Privet Secretary & English Stenographer posts. Currently this advertisement is published in only newspaper, full official details will be available on 2nd March, 2016. You can view official advertisement by given below image. Educational Qualification, age limit, selection process & more details will be available at 02/03/2016. How to Apply: Interested candidates can apply online through website http://hc-ojas.guj.nic.in.